I typically don’t do a lot of decorating for Valentine’s Day, except for some fun treats laying around. 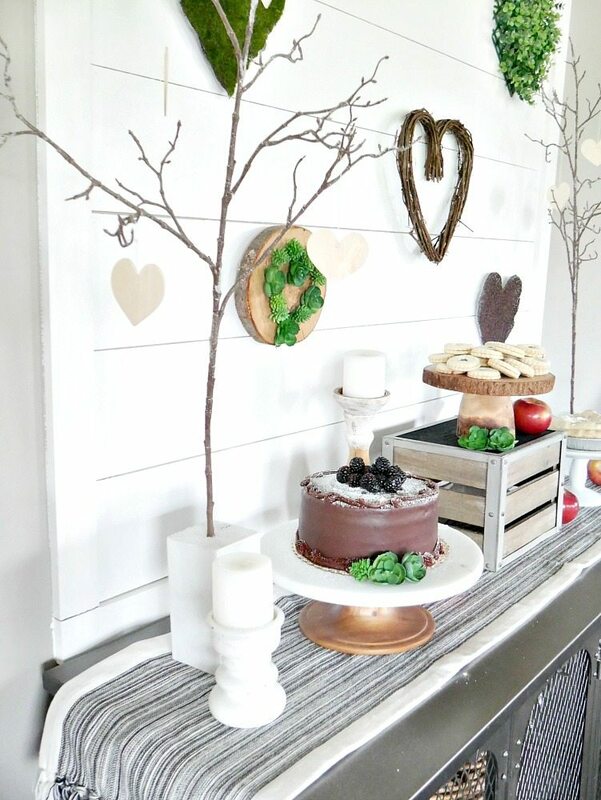 But now that we have this amazing Shiplap Display Wall in our kitchen area, I HAD to decorate it for the upcoming holiday. That, and my daughter insisted on it. So here is my Nature Inspired Valentine’s Day Display. 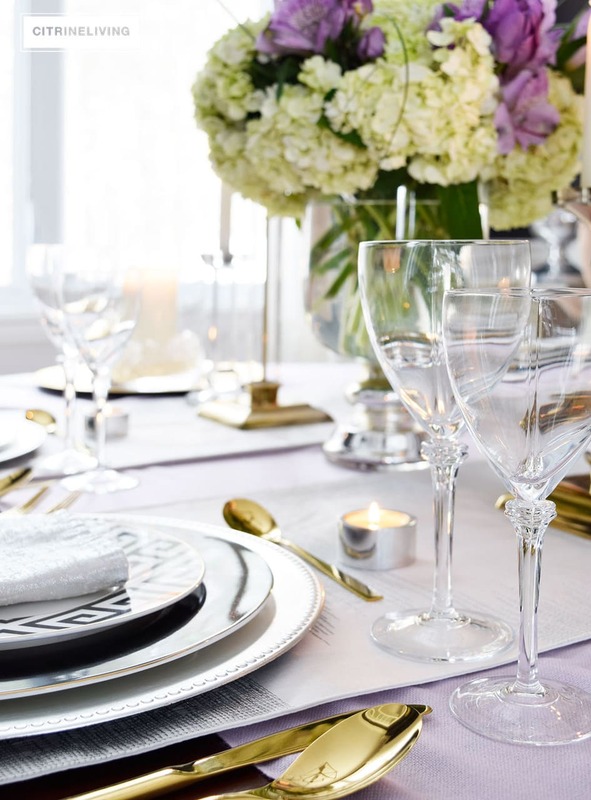 With the holiday just around the corner I’m joining Lory from Designthusiasm and several other bloggers and sharing our own take an Entertaining for Valentine’s Day. If you are coming from On Sutton Place , welcome! Head to the bottom of the post to see the full group. I love that Pantone’s color of the year is greenery! It’s the only ‘color’ I use around our house. I think it adds a freshness and natural look that you can’t get from anything else. 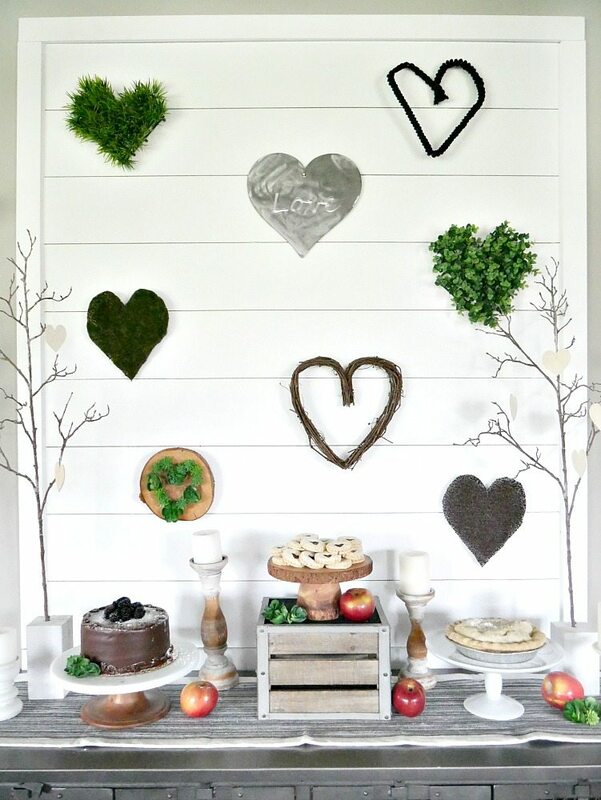 I incorporated the color of the year by making hearts out of faux grass and succulents. 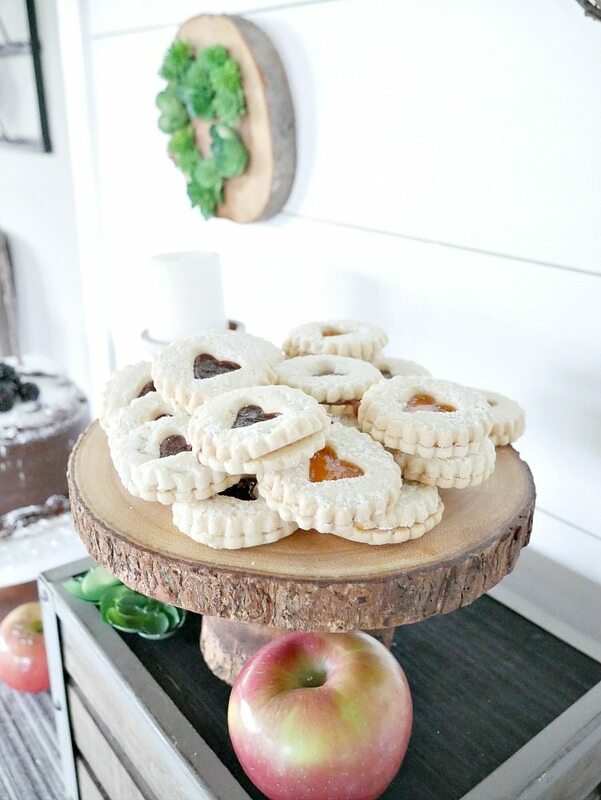 Which then turned into a little display of modern rustic hearts. Also! I have a new addition to this side of the room. I am so in love with my new chair for this space. 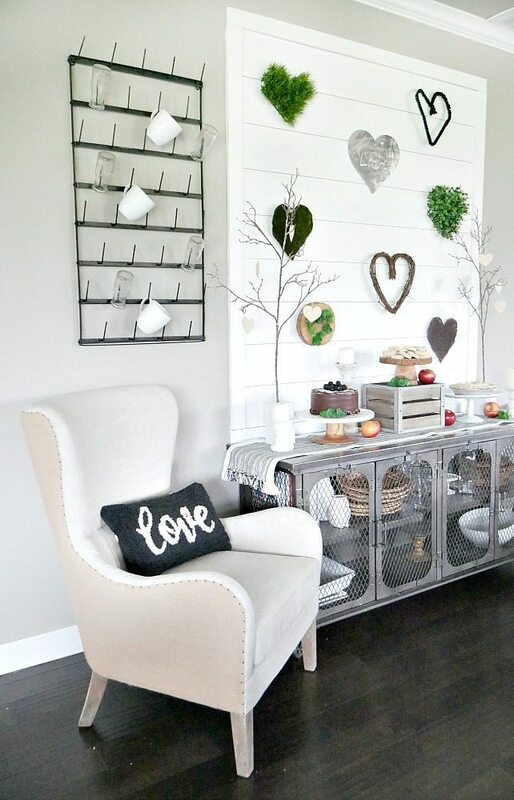 It’s the perfect mix of rustic modern, sleek lines with expose nail trim and white washed wood. 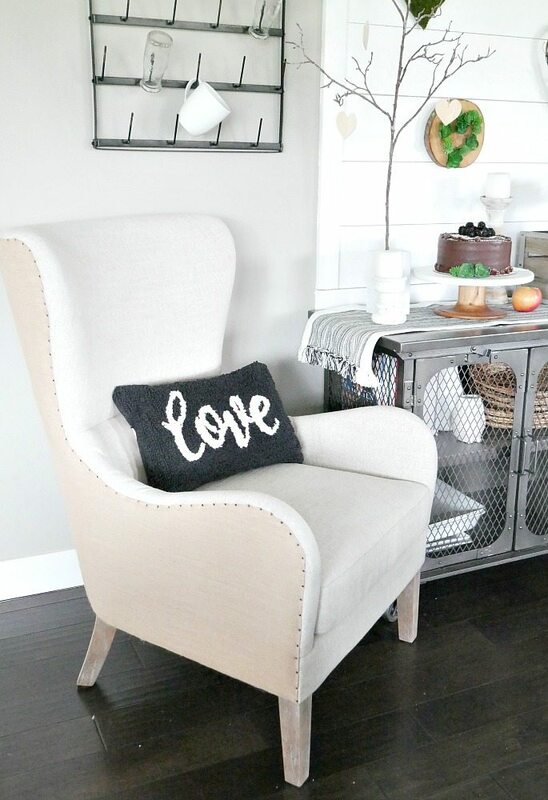 If you need a new accent chair, I definitely recommend this one! 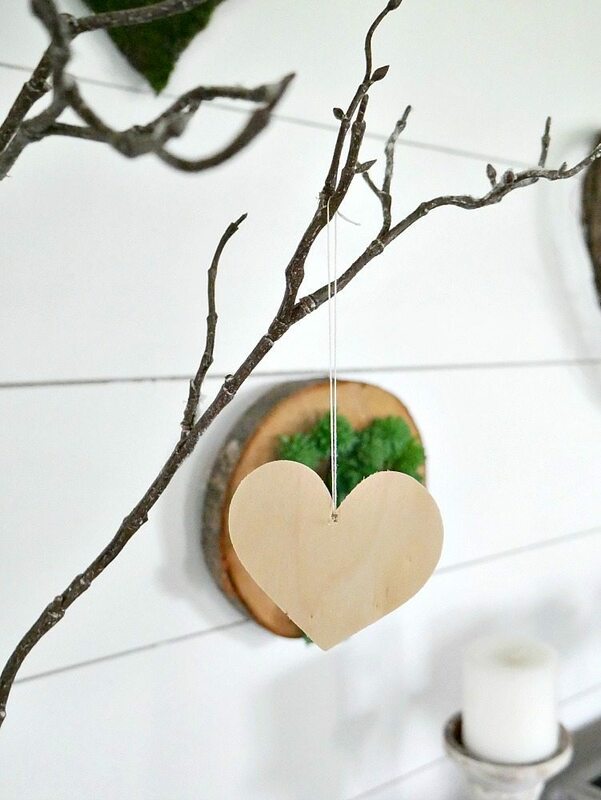 To continue with the nature inspired-look, I used some of my DIY Give Thanks Trees and switched out the branches for neutral ones, then hung a few wooden hearts on them. And what says nature better than a fresh apple pie and berries! My displays always take a little different turn than I originally invasion, once I start working with materials and playing with things they take on something new. Maybe next time I’ll stick with the traditional colors, but for now, it was fun to put together a little bit on a non-traditional Valentine’s Day Display. The next blog on the tour is CitrineLiving, you will love her display! You can also see the full list of bloggers below! Taryn, I love your natural decorations! Green is often the only color I use at home, in the form of plants. It’s great fun to be part of this Styled & Set Valentine Tour with you! 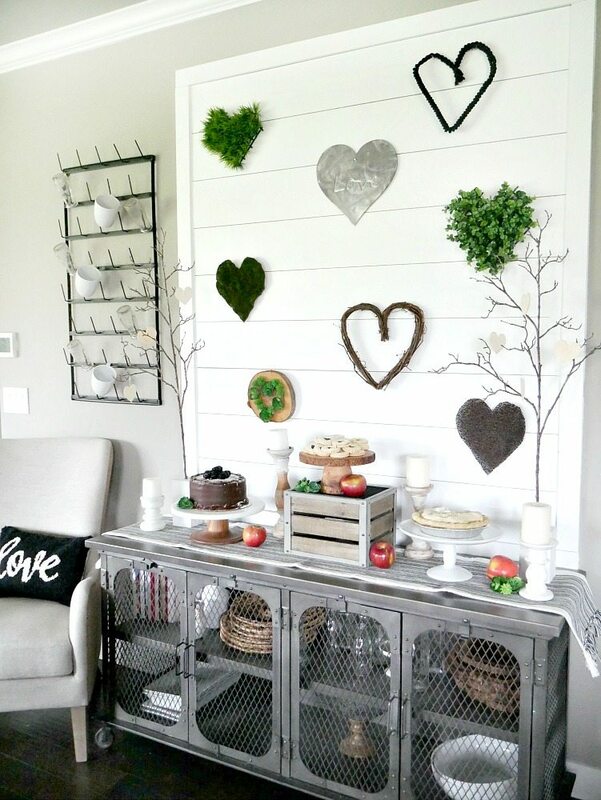 I love your heart wall! It’s all very festive and I didn’t miss the traditional red one bit. I just got the same cup rack you have hanging by your shiplap. I can’t wait to get it up now that I’ve seen yours. I enjoyed sharing the day with you…Happy Valentine’s Day! Taryn, your nature inspired display is just fabulous! 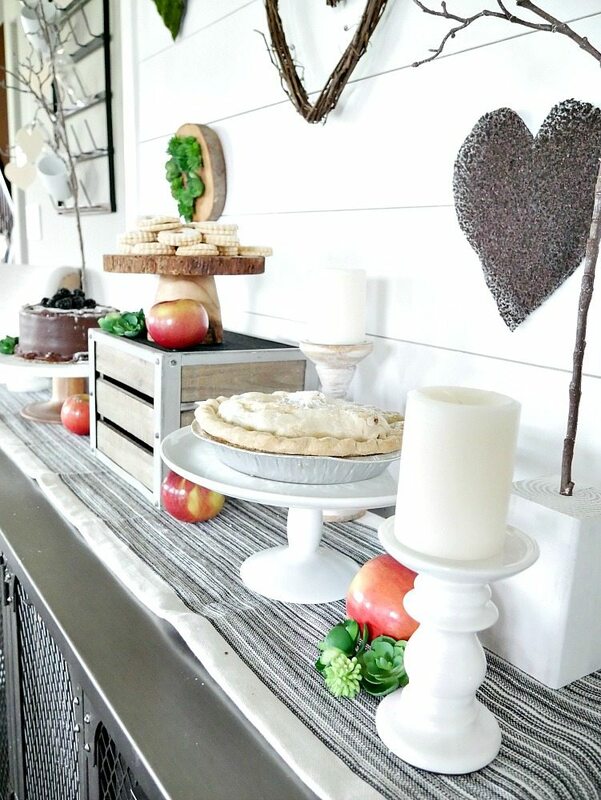 The DIY hearts against the shiplap wall are perfect and I love your little dessert buffet. 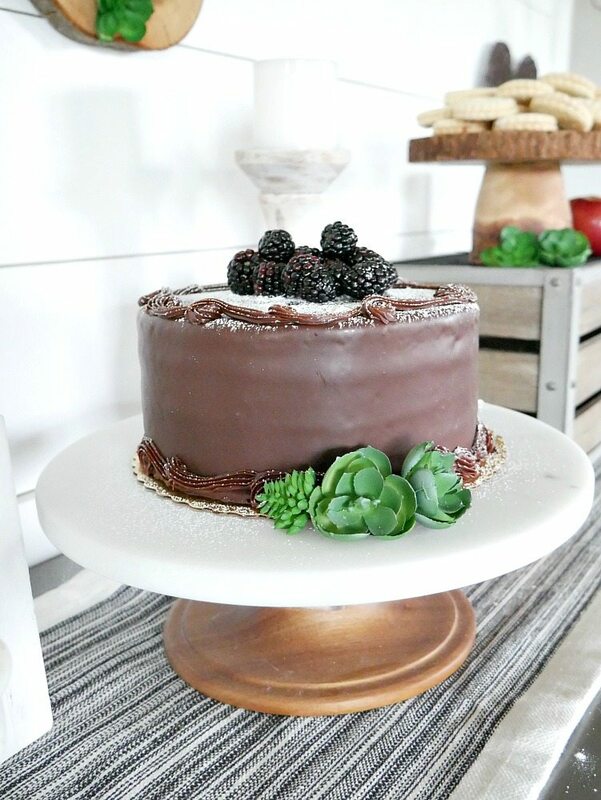 It looks delicious and welcoming!! Taryn this is so pretty. In a sea of pink and red it’s nice to see some green! Beautiful job. I love this wall! So cool and so creative! Such a fun idea! This is really a pretty post. I like the natural valentines, but the way you set up the pictures is really stunning. I learned some displaying tips looking at your post. Pinning it. Oh thank you so much! That is the best compliment!